After being teased in sketch form, and leaked a little while after that, the Hyundai Sonata facelift has finally made its debut in South Korea. 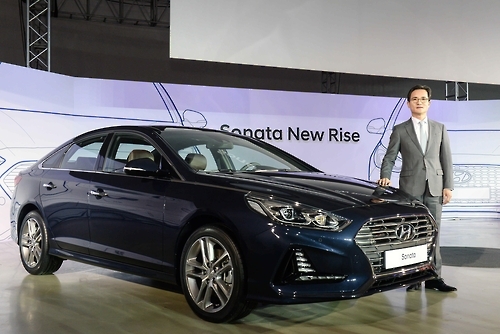 SEOUL, March 8 South Korea's Hyundai Motor Co unveiled a redesigned Sonata on Wednesday, aiming to reverse a fall in sales of a model struggling to stand out in a shrinking saloon segment. The interior has also been refreshed to look more premium with larger features, new finishes, updated steering wheels. Hyundai says the Sonata with the 2.0L turbo hits 62 miles per hour (100 km/h) from a dead stop in 7.5 seconds and can accelerate from 50-74 miles per hour (80 to 120 km/h) in 4.8 seconds. Two new wheel options have been added and the tail lights get a new design and light signature. Regular Sonatas will have horizontal fins in the grille while the sports models get a dark mesh treatment. Buyers there will get four engines to choose from - a 1.7 litre VGT diesel (141 PS/340 Nm), a 1.6 litre Gamma T-GDI petrol (180 PS/265 Nm), a 2.0 litre Nu petrol (163 PS/196 Nm) and a range-topping 2.0 litre Theta T-GDI petrol with 245 PS/353 Nm. The new engines also meet global standards with the largest of the group now selling with a 2.0 liter turbo engine. In South Korea, all trim levels will be equipped with a seven-inch display at the centre console as standard, while optionally offered will be a slightly larger eight-inch screen. In terms of tech, the new Sonata gets wireless charging for cellphones, a new USB port, and Apple CarPlay and Android Auto. The facelifted Sonata will debut in U.S-spec at the New York Auto Show in April and is expected to look identical to the vehicle pictured. Lane departure warning, lane keeping assist, high beam assist, blind spot detection, rear cross-traffic alert, and adaptive headlights make up some of the Sonata's safety features. In the US, where Hyundai sales rose 1.7% past year, Sonata sales slipped 6.5% to 199,416, reflecting Americans' waning interest in midsize sedans compared to red-hot compact and midsize CUVs.